● Apple can then decipher, alter the payload of the message and sign it before sending to its final destination. 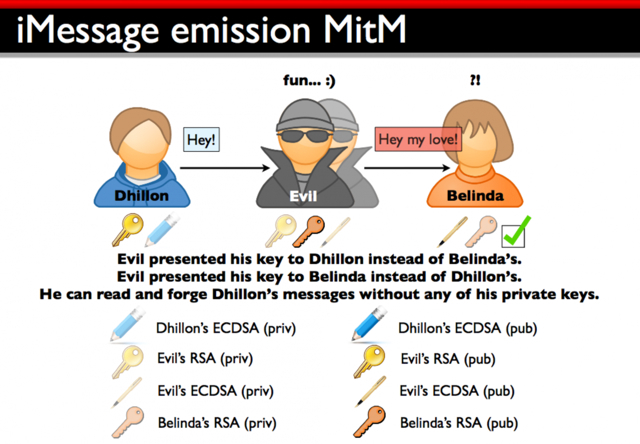 They conclude, "So, yes, there is end-to-end encryption as Apple claims, but the weakness is in the key infrastructure as it is controlled by Apple: they can change a key anytime they want, thus read the content of our iMessages." Independent security researcher Ashkan Soltani tells AllThingsD that while it would be difficult for outside attackers, the research appears sound. 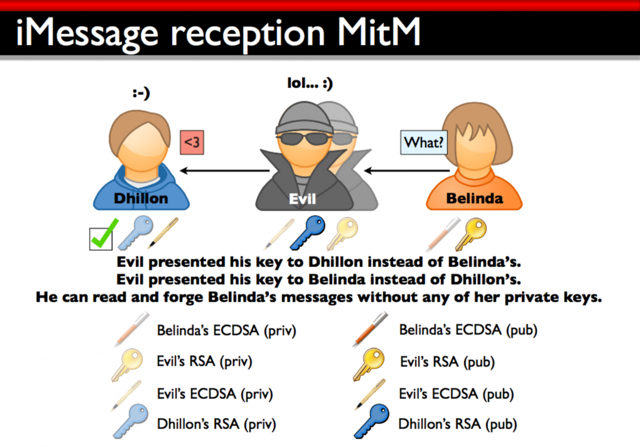 In addition, QuarksLab hinted that it might be possible for the NSA to replace Apple to perform the MITM. "Clearly, not the many people have such capabilities. Maybe 3 letters agencies... Who knows."